The Tokyopop tour bus swung by the Books & Co. near my office today, so I stopped over to see what the deal was. I got there about 2:50 and the bus was already parked out front. 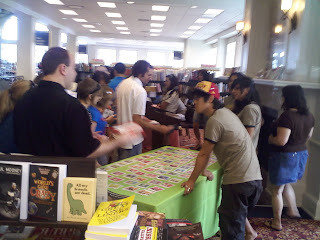 Inside there were some chairs, tables and a podium set up already where the store often holds signings and whatnot. 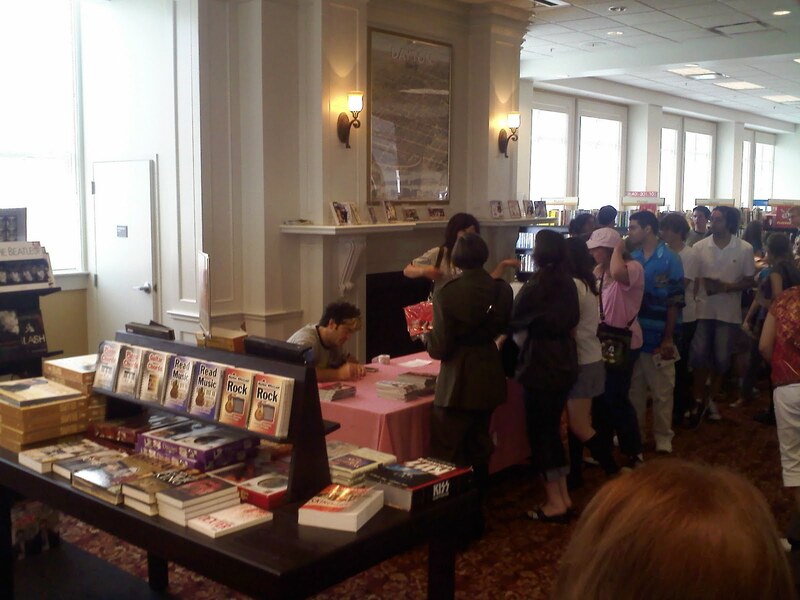 Conveniently for this event, the store's graphic novel/manga section was right there. The crew, all wearing America’s Greatest Otaku t-shirts, were still setting the tables up with swag of various kinds and Stu Levy was chatting with someone who, even at a glance, appeared to be the store manager. One of the crew members passed out raffle tickets to everyone who had taken a seat, and the store manager then provided a short welcome speech. After a quick introduction of the "Otaku Six"... ...Levy talked a bit about Tokyopop's beginnings and answered a number of questions from the audience. 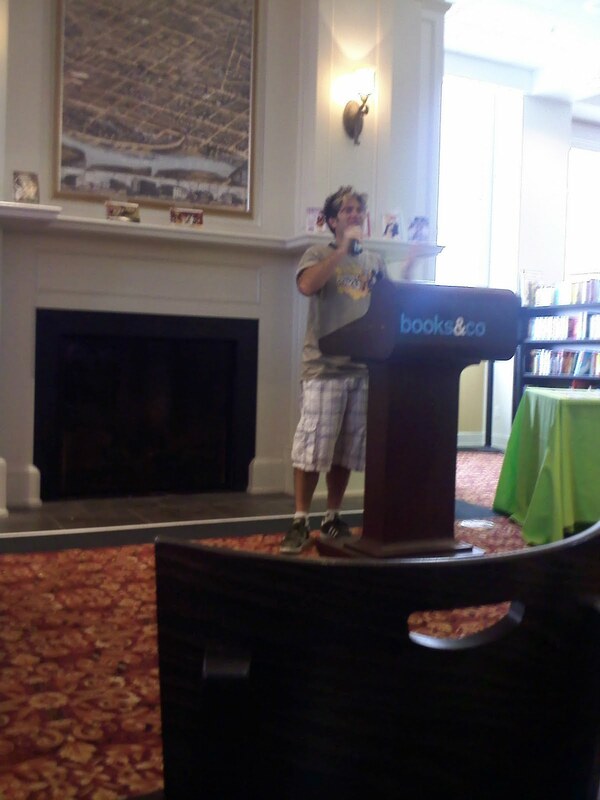 Most of them suggested the audience knew little about manga and/or anything about publication in general. 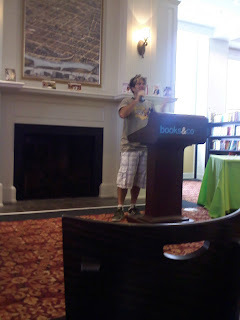 There were a few teenage girls in the front row (all cosplaying) who seemed to know their stuff, but I got the sense that most of the audience were folks who happened to be in the bookstore at the time anyway. 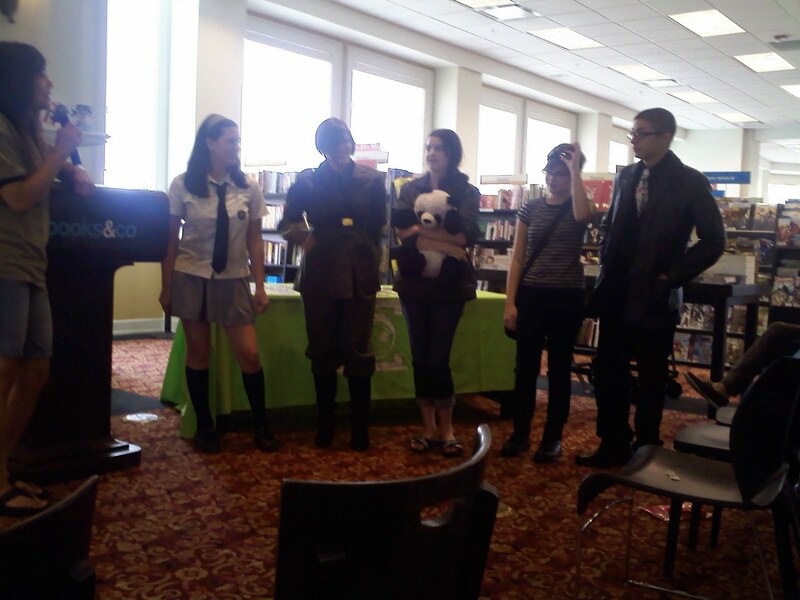 The Otaku Six then took over the remainder of the program. They plugged a few of Tokyopop's books, some new some older and then raffled off a number of items from t-shirts and hats to DVDs and CDs to manga. They then called up the handful of cosplayers in the audience for some kudos. (I haven't read any of the series these come from, so I can't comment on how 'accurate' they are. Though I will say the girl with the shiny belt buckle above -- cosplaying as Italy from Hetalia -- had on a killer pair of boots, which you obviously can't see very well here because of the heavy backlighting from the windows.) I believe all of these folks got some Tokyopop swag for their efforts. 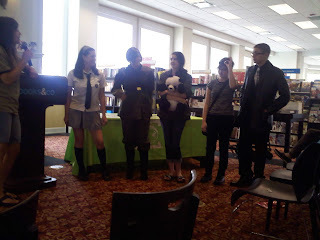 The Otaku Six (well, two of them) performed a skit of sorts to teach some simple Japanese phrases, and held a trivia contest. 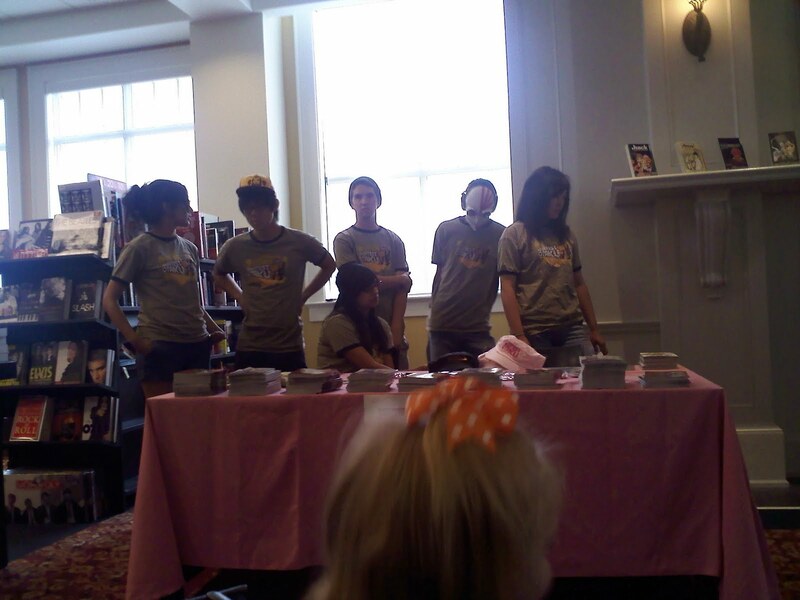 The contest was another indicator that the crowd wasn't terribly into manga -- they had to keep resorting to the easiest questions and even some of those didn't get answered by the audience. There was another round of raffles. That all took about an hour and gave them, in theory, another hour for the crowd to pick up some of the promo materials and get stuff signed by Levy. 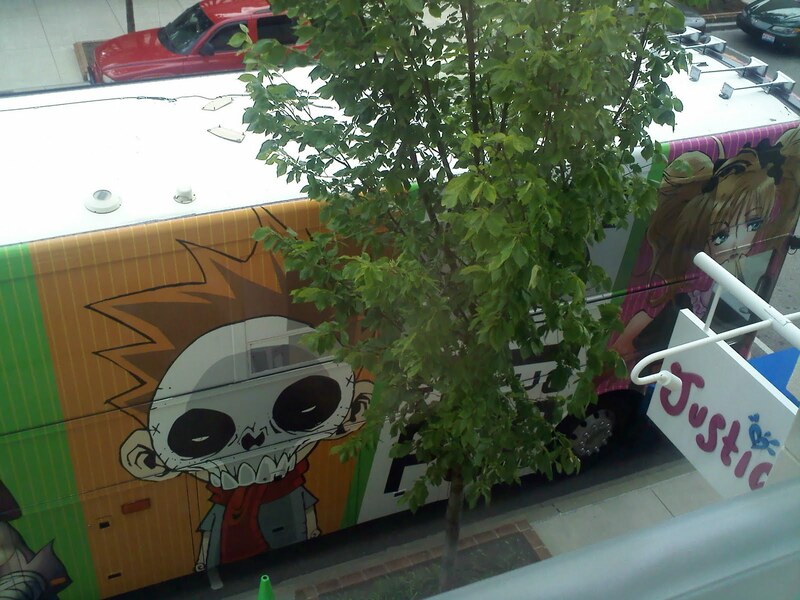 The event seemed a little loose, and was largely run by the Otaku Six. Aside from the Q&A, Levy provided little obvious direction. They all seemed pretty enthused, despite having been on the road for over a month (apparently including sleeping in the bus itself) and it was easy to see why those six folks were chosen for this tour. I think they were thrown off a bit by this particular stop NOT being a part of their America’s Greatest Otaku filming though. I suspect that was a timing issue more than anything, but without a large, dedicated contingent of existing Tokyopop/manga fans, I think they were thrown slightly by what to do with everyone. Still, it was a decent event. Everyone walked away with sampler copies of Deadman Wonderland and Fruits Basket, and I scored Sokora Refugees vol. 2 in one of the raffles. (Which I hadn't heard of before, but the art, at least, looks quite interesting.) Several of the other folks who won items from the raffle seemed genuinely pleased with their loot, and those last two photos show there was a decent crowd who hung around after the main event. It was, but that was by design, I think. Dayton was a secondary stop, probably chosen so they didn't waste half of a day between Indianapolis (they were at GenCon though the 8th) and Louisville (they are at the Mini-Mini-Mini-Mini-Convention today). Had they just driven straight through, they would've had most of Sunday with nothing to do. So hitting Dayton broke the trip up nicely for them. Conveniently -- and I'm sure this all played into the decision to stop -- Dayton is just about half-way between the two destinations, that particular Books & Co. is right off the highway and there's plenty of dining options there easily within walking distance allowing them to get lunch before the event and dinner afterwards without having to get off the highway again. Also, randomly amusing, Tokyopop pinched a couple of my photos here for their Facebook page, but did't actually reference, much less link to, me or my blog. Aah, ha, ha, how cute of them. Now to respond, should we flip for it? Heads, anthrax powder; tails, arson? Okay then, never mind. Anyone need several large canisters of kerosene? It looks like Tokyopop's rise out of the dust was due to having the reigns passed to someone else in the company and they're just letting him be CEO for some reason maybe. Wasn't T-pop's original downfall due to Levy's management? I wonder how it changed for the better. I'm glad it did, but I just wonder how. Imagine manga as a battlefield and you'll see many T-pop manhwa and some manga lying there dead. I love your article! I was re- reading articles online about the tour that came out while we didn't really have internet on the bus haha. Well we did but during driving times it was extremely slow or non-existent. :) Thank you for stopping bye back then and writing about the event!